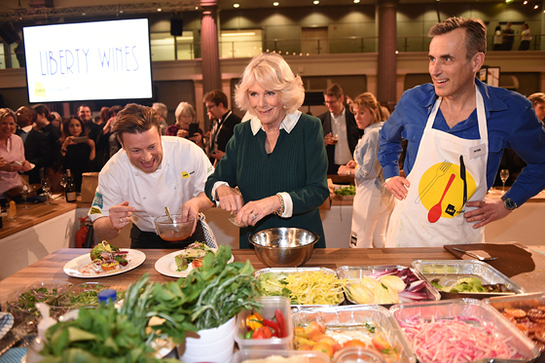 The Duchess of Cornwall attended the UK CEO CookOff in London this week in support of the charity UKHarvest, of which Her Royal Highness is Patron. 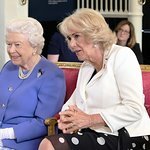 The Duchess was greeted by chef Jamie Oliver and representatives from UK Harvest and the Jamie Oliver Food Foundation, who were joint organisers of the event. UKHarvest is a food rescue operation that collects excess food from commercial outlets and delivers it to charities, which is then distributed to those in need. The UK CEO CookOff saw business leaders team up with chefs to cook a banquet for people who spend their time helping others. The 400 diners, deserving unsung heroes, were served a three-course meal from produce that typically goes to waste and special items brought by the chefs, with mains ranging from roasted rack of lamb to ravioli filled with wild mushrooms and ricotta cheese. During the evening, The Duchess was given a cooking masterclass by Jamie Oliver, joining the chef at his cooking station. Her Royal Highness assembled a mozzarella salad with blood oranges, beetroots, leaves and watercress. The Duchess was shown around the open chef kitchens by Ronni Kahn whose organisation OzHarvest is the inspiration for UKHarvest. Ms. Kahn, who said her organisation had delivered 60 million meals over the past 13 years, said: "OzHarvest is magic, UKHarvest has the same magic; everything about our model is to make sure that good food does not go to waste.